These truffles-of-sorts can be made with all sorts of ingredients, but the main bulk, and the sweetness, comes from dates. These here are approximate measures, feel free to add more or use less of anything to get the texture and taste you prefer. These are a wonderfully sweet, but refined sugar-free treat, and good brain-food for kids’ lunchboxes or to keep in the office drawer. They’ll keep for a week or more in an airtight container. 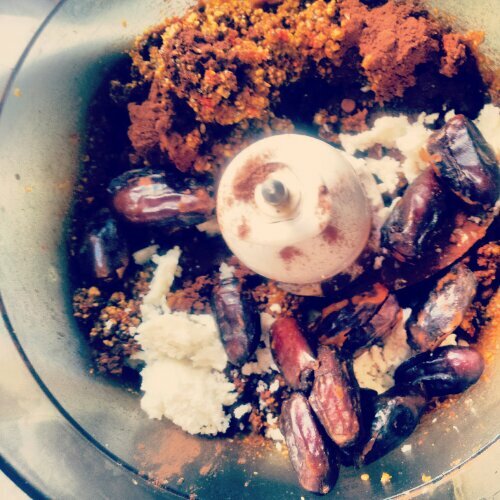 Soak 1 1/2 cups of dried dates and 1/4 cup goji berries in a little boiling water to soften slightly. Drain well and place in the bowl of a large food processor. Add 1/2 cup sunflower seeds, 1/4 cup black chia seeds, 1 Tbsp good quality cocoa, or raw cacao powder (I used Green & Blacks), 1 Tbsp cacao nibs, 1 Tbsp coconut butter or coconut oil. Process everything on high, or pulse, until as smooth as you can get it. Roll into balls and store between layers of waxed paper to prevent sticking. I’d like to roll the balls in desiccated coconut, but I have a coconut-hater in the house. 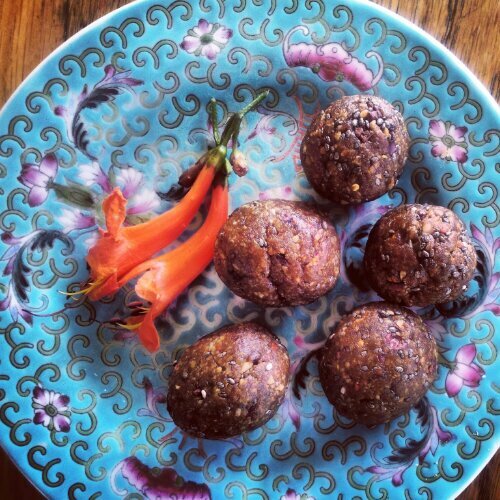 The chia seed and cacao nibs are too small to break down in a regular processor so they give these balls a bit of crunch. 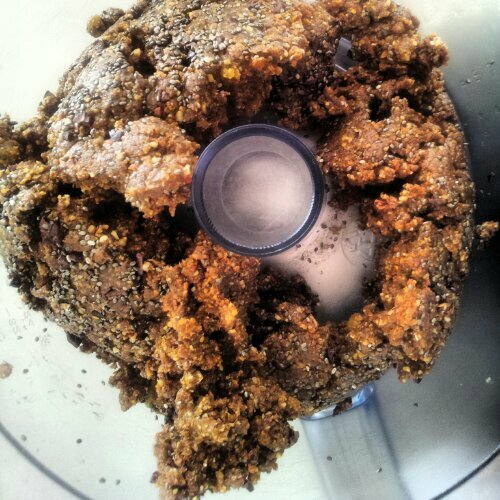 If you like smoother balls (aaa ha ha), omit or grind them in a spice/coffee grinder before adding to the mix. Am I the only one who noticed dodgy connotations in the title?